Why is that you assume malice? The title of the thread is clear. You have done loads of measurement. Can you clarify what power the fridge is using in hot weather, or is this all just a pointless exhibition of complex measurements that have no meaning? In the post, I clearly state that ".... These charts are for the entire day yesterday - midnight to midnight - and show what power is being consumed - not just for the fridge, but in total. However, as per previous discussions and graphs, the fridge has a very distinctive tell-tale when it comes to power use, so it is very easy to spot Fridge Power and non-Fridge power"
So if anyone takes the total figure give, and then says in a reply that my conclusion was all the power used was for the Fridge is clearly either not bothering to read the posts properly - in which case PLEASE REREAD! ; is following their own agenda - in which case go Troll elesewhere; or Just doesn't understand simple maths - in which case ask for help, don't make daft and incorrect conclusions. Now the purpose of the post? As the quotes from the beginning imply .... What difference does a higher ambient temp make? That is what I was answering rather than how much power is being consumed by the fridge. It is a comparison to how often the compressor comes on compared to cooker temps (as I had already established in previous posts the compressor on time and power used for each cycle and the variation was with the frequency of the on cycle). If anyone wants to work out the power used specifically by the fridge on the specific day in question, all the info is there in this thread. I am not intending to do so as I have no need to do so as I have worked this out in general terms and have (and posted) enough data to make my conclusions. Thank you for such a detailed analysis, I have followed every page with interest. I did a very similar test a couple of years ago and posted my results on another self build forum. My test was not as detailed as yours it was more redneck based as I dont have your level of knowledge when it comes to electronics. My results were convincing enough for me to buy a £75 ac fridge from Currys and use my existing 1000w inverter. I just wish I had at that time a report like yours to refer to, I would have bought a more energy efficient fridge and a psw inverter as my inverter runs the compressor motor too hot. I cant believe any one could post such negativity re your hard work and time spent compiling all this information for the benefit of others, I thought you handled it very well. The cost of 12v fridges I think are just ridiculous compared to 240v this is why I did my testing. I can afford a 12v fridge but hate being ripped off, I shall be going down this route with my van conversion and would like to thank you for your time and trouble making this available to us. regards John. Please would you measure how much power your fridge uses in 24 hours during hot weather? Clearly you do have the ability to measure the power used, so it would be useful information to share. Ideally, the figures would be of the DC power into the inverter but if that also drives other significant loads, the AC power into the fridge would still be useful info. Over the past three or four days, we have mostly parked in the shade. Certainly for the last two days, the solar panel output has been more or less nil. As a result, the battery bank is down to 90.2% full. The reason I would like to know how much power an efficient compressor fridge setup uses is to determine how big a battery bank it would need, in addition to domestic loads, in such circumstances. This is something I can't discover for myself, because my fridge runs on gas. AC Fridge in a Campervan - The Conclusion. This may be of interest to you? First the disclaimer - My Camper is not a lab, I do not check for a "control" to ensure only one thing varies, so while the information I believe is useful and interesting to those so inclined to read and review it, it should be taken for what it is - a snapshot of a single campervan at specific times. So what an I going to show? I chose the time range to monitor the power use to be from 9PM to 5AM as that eliminates external factors such as solar power input, courtesy lights coming on if I enter van (these are wired to leisure battery on my camper), etc. Note that the Power, Current and Voltage ranges vary slightly between the two days as they are auto-generated (I am using screenshots of Victron VRM charts, not my own generated Excel ones here), so to compare the days for absolute values, please read across to see the values. The Fridge is running after being defrosted. It has drinks in the door pocket but apart from that is mostly empty. You see this kind of sawtooth pattern here - each 'tooth' is the fridge coming on for a set time. When the fridge is on, total power draw is around 52W; When the fridge is off, the total power draw is 18W. This 18W constant use will be: Inverter O/H, Raspberry Pi computer, Network Router & Wi-Fi Radio Booster, and finally the roof fan (left set to Auto so I cannot be sure if it is actively running or not). There seems to be two different patterns of Fridge activity which I will guess is a factor of the amount of cooling required. The chart above shows short - 5 minute - bursts of Compressor on-time, but quite frequent. The other (more common pattern looking at historical data) is the Compressor being on less frequently but for a longer time (around 15 mins). As far as numbers go, with the short bursts, it uses 4Wh each time it kicks on (I have added 0.6Wh for the big on-rush that happens each time but lasts just a few seconds). And the longer but less frequent runs it uses 10Wh each time. An interesting pattern here - I don't know for sure but I think this is down to the data graphing granularity being limited plus maybe the roof fan motor (I really don't know!). Bear in mind here that each line mark is just a single Watt difference so step changes can appear exaggerated. Why is the minimum higher now than when the fridge was running? actually very simple to answer that ... The fridge door was open which meant the light was on! that is (I think) a nominal 6W bulb. Anyways, that is the minute by minute graphing of the two nights - what is the conclusion? 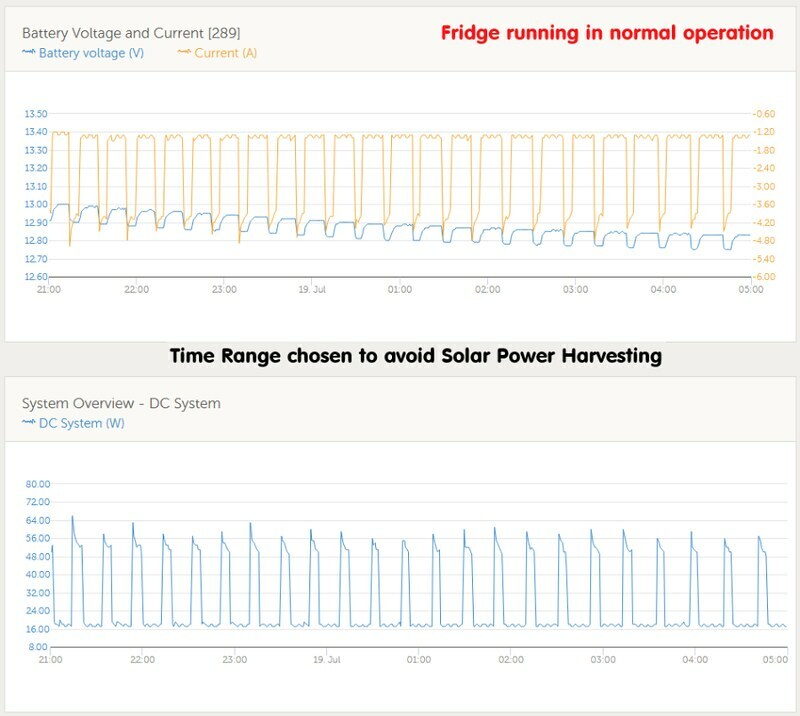 So the Fridge being ON meant over the 8 hours examined, the Fridge drew approx 30Wh more power on the graphs. Add on the Fridge Light use that shouldn't really have been in the OFF chart (so 6W x 8 Hours) and you will get a total of 78Wh usage over a 8 Hour Period specific to the Fridge being on. What I can say is that despite the very high temps we have had in the UK recently, the Fridge has worked without a hiccup and food and drink has been kept cold and it has had to work at the same temperature extremes that a Weaco 12V Compressor would (i.e. above the Weaco/Dometic official upper operating limit). This may or may not have answered some questions, but that is probably it from me in terms of providing power usage for the fridge installation. I chose the time range to monitor the power usde to be from 10PM to 5AM as that eliminates external factors such as solar power input, courtesy lights coming on if I enter van (these are wired to leisure battery on my camper), etc. So the Fridge being ON meant over the 7 hours examined, the Fridge drew approx 30Wh more power on the graphs. Add on the Fridge Light use that shouldn't really have been in the OFF chart (so 6W x 7 Hours) and you will get a total of 72Wh over a 7 Hour Period specific to the Fridge being on. That's a very good piece of work, very well presented. We often have opinions. It's great to have facts. We'll done and thank you, wildebus. You've set the bar high throughout this thread. It's very interesting, but couldn't you pick one fairly warm day, disconnect the solar panel and see how much power the fridge uses in a 24 hour period including a typical summer's day? That would seem to give a clear indication without taking all that much effort. Do the fans run on mains voltage? 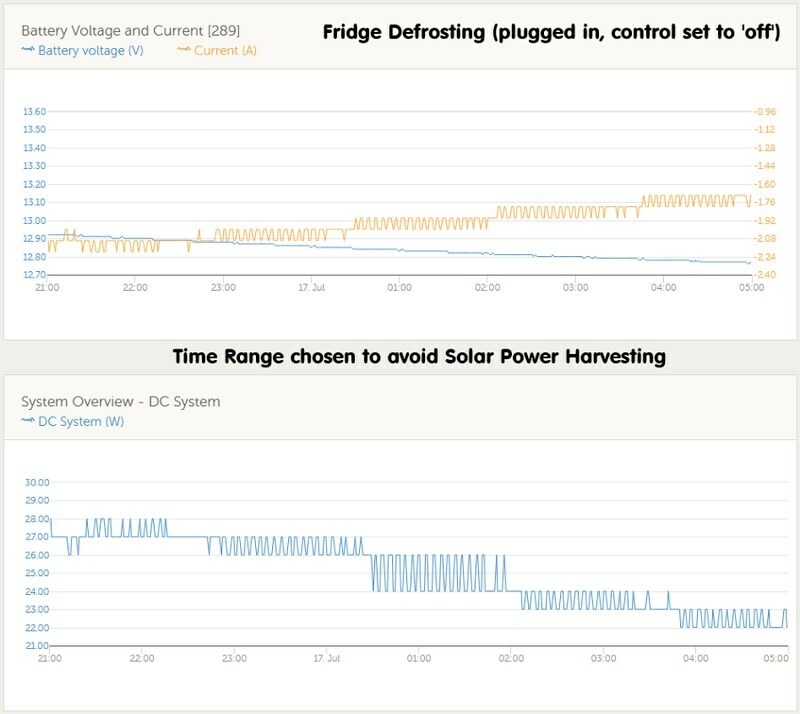 If the only thing using mains is the fridge, fitting a standalone power meter on the inverter input would give the figures more easily, though you'd not get the fancy graphs. So with the inverter overhead, you are looking at about 234 + 96 = 330Wh per day to run the fridge. Probably about the 330Wh mark - more than a 12V fridge when you include the inverter, but less than a 12V fridge without the Inverter. As said, I use the inverter for other things anyway - primarily the network router and WiFi booster, but also laptop charging and power tool battery charging. I could repeat the tests in hundreds of different combinations but I have reached the conclusions I need to and the various information items I have posted over time on this thread (including in weather at the other extreme) can be used by people to draw their own conclusions about this option. Ref your first point, I really don't need to do that as I know precisely how much power is consumed and precisely how much the solar array is providing with the data provided by the MPPT controller and the BMV-712 monitor feeding into a Victron Venus GX system which does the minute by minute collation. (I can download the spreadsheets as well if I want to). You will have noticed in the last charts it is showing consumption and where the power is from - Battery or Solar. I can alsos select "Solar" and see how the solar is being used; or just see the two side by side. I chose the time range I did as it shows the current and voltage changes which is of passing interest (at least to myself) without the effect of solar. It seems to me that for many people (athough not in your setup) it could make sense to use a dedicated inverter to power the fridge, using the fridge's thermostat to turn power to the inverter on and off. That way you'd get lower inverter losses. Perhaps saving about 50 watt hours a day. I'm not sure whether you could use a cheap MSW inverter. An electic motor might not be as power efficient with a lumpy waveform. Your suggestion would work quite well I think, but would need some additional gizmo between thermostat and inverter (as the thermostat would not supply any power to switch on the inverter as the inverter is off and so the fridge will have no power). The controller I am using to activate the extra fan for the compressor would work maybe but that has an on-off range of 3 degrees and maybe needs to be tighter? The Victron Inverter I am using has an eco mode, and turns on when it detects a demand - but I found that a fridge does not activate it. (I didn't investigate this much as , as said, I want the inverter on generally anyway). I think Hairydog means run the 12v power supply wiring through the stat for the inverter, the original 230v wires on the stat would need to be shorted together. What could well be possible is using the remote wired feature on the Victron Inverters where instead of having the remote link shorted, you just run that link to the 'stat and back, so no addtional power supply required and also when the inverter has power removed (as opposed to being just off), there is no power going to the fridge - either 230V or 12V. What I had in mind was using the 230v thermostat contacts to switch on and off power to the inverter (though a relay), which I'd do by cutting into the wiring between the thermostat and the fridge, and yes, the fridge side of the cut wires would need to be shorted together. The only issue I can see is that the interior light wouldn't work unless the compressor was running. Could you just put the thermostat on full (or as cold as you would ever want), and not change any wiring anywhere within the Fridge - then use a separate temp probe which goes to a controller (such as the one I am using for my fan control) to turn the inverter on and off when it hits the required threshold? This might simplify mucking around with dismantling bits and pieces of the actual fridge which could be awkward? This is something I might have a play with actually out of curiosity and also could be of some worth over the winter where I generally won't be using the camper as a camper but might want to keep the fridge going in readiness? The Solar Array might have issues keeping up if extended non-use, especially if we have snow again, so this would extend the time if I can't be bothered to hookup at home. @wildebus can you tell me what exact model inverter you used and a cheap place to get it? If getting into the fridge wiring is difficult, you could do that, but then you lose the option of using the fridge's temperature control.